Captain America Comics #1 & all TIMELY SUPERHERO Incompletes, Pages, Covers, Water Damaged, Tape, Brittle, Remainders, Torn and Nice Ones Too! JB123 replied to JB123's topic in Comics Market - Want To Buy! Nice.... I love this item! Is she dressed appropriately for court proceedings? JB123 replied to RobbieC's topic in Comics Market - Want To Buy! You sure it's not page 22 and that there are more loose out there? 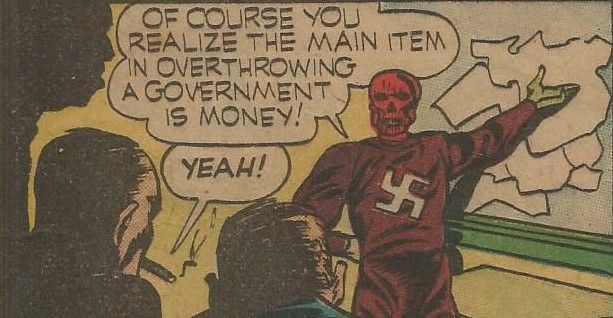 Red skull strikes! March Bump in honor of March 1941 Cap 1 Release! I have a Question! If a person owns 19 of the 32 interior pages loose...…….. Are they a member of the club? !